InitConds is a sequence of legal initial condition specifications. The symbol [InitConds] means the presence of the InitConds fields is optional since only some devices require initial conditions. The individual fields in each device statement must appear exactly in the order indicated in this chapter. Any different sequence will cause SIMPLIS to misinterpret the statement or generate an error message. SIMPLIS does not require every node in the system to be connected to each other, allowing the system to have isolated subsystem. However, error messages will be generated if the user instructs SIMPLIS to determine the voltage between two electrically isolated nodes. 3.1 Definition of the voltage and the current association for a two-terminal element. as measured from the n+ terminal to the n- terminal. When the current through a two-terminal device is mentioned in this manual, it refers to the current measured in the direction from the positive node through the element to the negative node. Thus, a positive current indicates that there is a net flow of charge into the positive node, through the two-terminal element, and then out of the negative node. With these sign conventions for voltages and currents, a positive voltage-current product indicates that electric power is instantaneously flowing into the corresponding two-terminal element, whether it is a voltage or current source, a resistor, or any other two-terminal element. value is the value assigned to the parameter. To make the input file more readable, blank characters can appear before and/or after the equal sign ('='). In addition, if the equal sign is the last significant character in the current line, the value can appear in the next line through the use of the line continuation character, the plus sign ('+'). 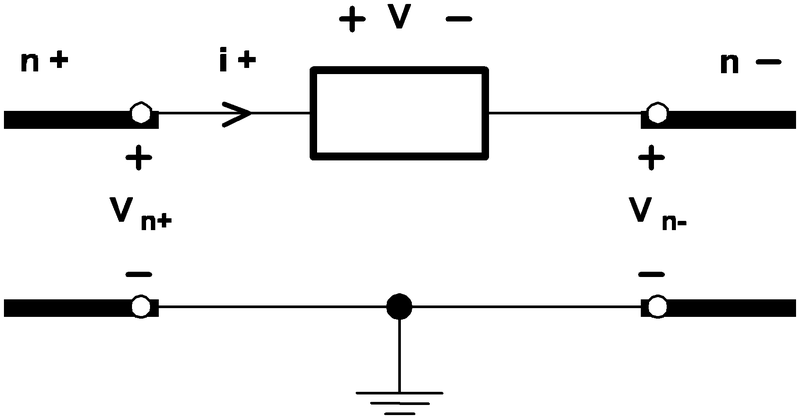 A current through a controlling device in the same circuit.